The Candelabra is the symbolic element that brings together the candles, and all the concepts and affirmations. We utilize a candle holder that is in itself representative of a number of additional spiritual concepts. When viewed from the top, the candelabra is simple. It can be seen as representing the circular nature of the seasons, going from winter to spring to summer, to fall and back, to start all over again. Typically, the first and fifth candle are taller than the others. The hope is that Luminescence will become a holiday with a tradition for us to make candelabras of all types. They can be made of wood, clay, metal, just about any material. Children can make them out of folded paper, with the candles colored in by crayon. You can decorate them any way you want. The four sections of the layout can certainly be drawn as to signify the seasons. The candelabra can be simple or it can be ornate. There is no wrong way to make a Luminescence candelabra. All of them are correct! 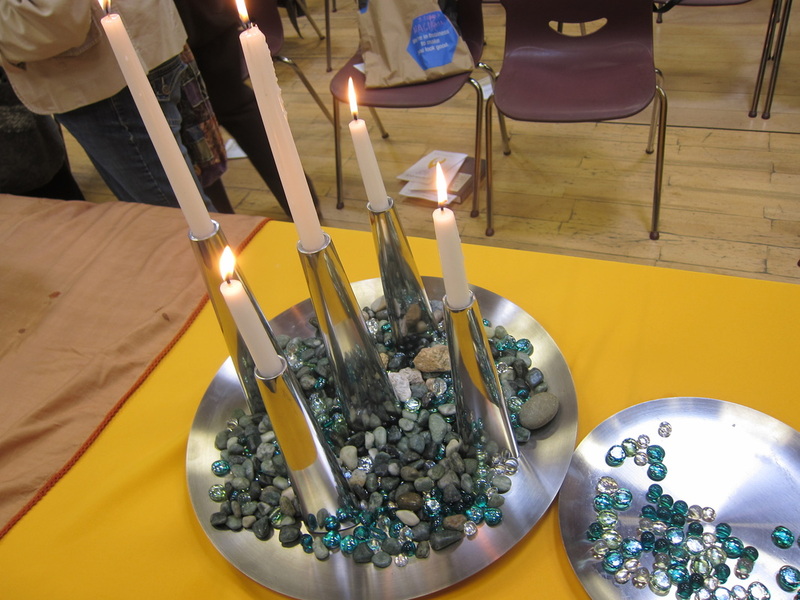 If you would like to share your images of your congregational or individual Luminescence candelabra, submit your photographs here. Please keep in mind that by submitting your photographs, you are giving permission for them to be displayed on this site.